Doug and Donna Summerhayes are the first to admit their family “lives, eats and breathes cystic fibrosis.” The founding members of the Canadian Cystic Fibrosis Foundation have a very personal connection to CF; two of their four children were born with it. In May of 1959 Doug & Donna Summerhayes organized a meeting of more than 100 parents of children with Cystic Fibrosis. At this meeting, they laid the groundwork for what later became The Canadian Cystic Fibrosis Foundation. In the early years, Doug and Donna traveled throughout Canada, often at their own expense, to raise awareness and help establish local chapters. Doug was the Foundation’s first President and Donna was the first editor of the Foundation’s newsletter. 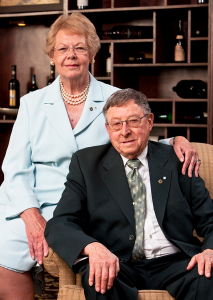 For their continuous efforts and remarkable achievements, Doug and Donna Summerhayes were awarded the Order of Canada, Donna in 1987 and Doug in 1988. Officially incorporated in 1960, this year marks the 53rd anniversary of (The Canadian Cystic Fibrosis Foundation ) Cystic Fibrosis Canada. In May of 2013, Doug and Donna were each presented with a Hal Rogers Fellow Award.